A bit over two months ago, I was struck with the idea of converting one of my favourite role-playing games of old, Castle Falkenstein (R.Talsorian Games) to Fate Core (Evil Hat Productions) and using the Deck of Fate. This is particularly apt because the original game used ordinary playing cards instead of dice. And now it’s the holidays, so I’m taking time for frivolous pursuits! I spent some time this week thinking about how to do this conversion. The skills are easy, and the character creation packages too. The biggest challenge is Sorcery, so I cooked up a draft. You can read the entire Fate_of_Bayern-v2.1 (it looks scary long, but it’s mostly because of the list of skills); but I’ll paste the sorcery discussion and example here. Edit: Ignore this link, there is a more recent, complete, and corrected version here. I’ll appreciate useful feedback on all sections, not just sorcery, since I still have some work to do on the draft; when it’s complete, I’ll post it in PDF, ePub and mobi ebook formats, as usual. For people who are local to the San Francisco Bay Area: I’ll be testing these rules at EndGame in Oakland some time in January. Sorcery in Castle Falkenstein is a learned skill, also it also requires talent. Any sorcerer can attempt to cast any spell they have access to from Lorebooks. The sorcerer studies the spell, then starts gathering power (thaumic energy) from the site; some sites are more favourable than others. Each spell is of a particular type or “aspect”: Emotional/Mental ♥, Spiritual/(Inter-)Dimensional ♠, Material ♦, or Elemental ♣. Using thaumic power of a different flavour causes harmonics, unwanted side effects. The sorcerer can opt to release the thaumic power already gathered rather than cast the spell. In theory, anyone can cast any spell if they have the training, the Lorebook, and access to the thaumic energy; the limitations on casting come from time needed to gather enough thaumic energy, and from the risk of harmonics. We’re going to use the Fate Fractal to model this. Spells have aspects, including the CF “aspect” or type, and the Lorebook they belong to. They have a “skill” associated with their base thaumic cost, which represent their difficulty level; they have a stress track which represent the calculated thaumic energy requirement, which represent how much power needs to be gathered to cast them. Harmonics represent consequences taken by the Sorcerer in order to cast. Finally, in Fate Core terms (as described in the Fate System Toolkit, page 143), the CF spells have fiat effects, so we’re not going to spend too much time drawing up lists of specific bonuses. 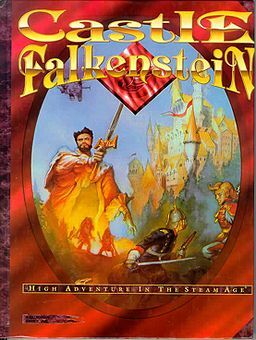 I’d like to use the Castle Falkenstein information as much as possible to limit conversion complications. We’ll use the values given in the supplement Comme Il Faut, as it provided some corrections to errors in the main rule book. As a first approach, we’ll use half the value of the base thaumic requirements as our spell’s skill or difficulty. Harmonics: The Deck of Fate cards’ moon and sun symbol indicate which type of thaumic energy is in play. Only suns = Material; only moons = Spiritual/Dimensional; more suns than moons = Elemental; more moons than suns = Emotional/Mental; one sun, one moon = as deemed appropriate to the fiction by the Host; eclipse = wild spell. [Edit: See the next post for corrections.] Effects of harmonics and wild spells are per Castle Falkenstein, pp. 203-204. With a Twist? 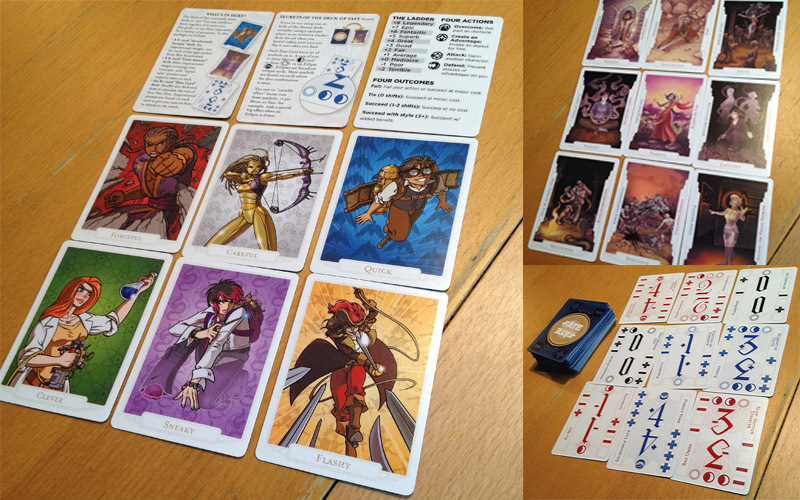 But I want to make it even more interesting, and I have the lovely Deck of Fate in hand… I can shuffle all the arcana from both the Core and Accelerated versions, and draw one at random to give specific flavour to the harmonics. I envision this to be used when the spellcasting is dramatically important, not when it’s a matter of drudgery. If the spellcasting is not a dramatic moment but just a means to an end, the Host and player can resolve it as a simple Overcome action. Aspects: Material; Osman’s Tome of Physical Movement. Difficulty: +4 (half of the base thaumic energy requirement of 8). Thaumic energy requirement, based on spell definitions (Comme Il Faut, p. 87): base of 8, duration: 1 day (4), involves one element (1), range: self (1), involves one person (1), subject is human (1), subject is self (1), spell does not do damage (0); minus the Sorcerer’s skill (3), for a total requirement of 14. When I turn this into stress boxes, it will become five boxes of 1, 2, 3, 4, and 5 each. First, Sister Althea studies the ritual; she create an advantage using the Education skill, which she also has at Good [+3]. The spell is not particularly obscure so the difficulty is Average [+1]. She draws a -1 for a total +2, a simple success. She will get one free invocation of the aspect Well-Researched Spell. Next, she starts drawing thaumic energy from the site. Let’s assume it’s a reasonable location but not particularly attuned to any type of thaumic energy. Each round, the Host draws a card from the Deck of Fate for Althea’s casting, jots down its value and the moon (C) and sun (O) symbols, then shuffles the card back in the deck so as not to alter the probabilities on each draw. There is no active resistance in this location, so we’ll just compare Althea’s result to the spell’s difficulty value to determine whether she draws thaumic energy point (on a suuccess) or “pays” by taking mental stress herself (on a failure). Turn 1: Althea draws -1, O for a total of +2 versus the spell’s defense of +4, so she fails to draw any thaumic power, and takes a 2-point hit. Bad start, and Althea checks her #2 stress box (she has Great [+4] Courage so she has a total of 4 boxes). Turn 2: Althea draws a +1, C, for a total of +4. It’s a tie, she will get a boost next round; let’s call it Feeling the Energy Flow. Turn 3: Althea draws a +0, O, for a total of +1 with the boost so she marks the first stress box for the spell. Turn 4: Althea draws +2 C C O, for a total of +1 again. The spell’s #2 stress box gets checked. Turn 5: Althea draws +2 C O O, another total of +1. The spell’s #3 box is checked off, things are looking good for Althea. Turn 6: Althea draws -3, O O O: a very bad result. She decides to use a fate point and her aspect Initiate of the Order of the Temple of Jerusalem to draw again (she could use her free invocation of Well-Researched Spell, but she thinks she’s may need to stack it later), and gets +3, C C O instead, a well-spent invocation . Her total is now +2, forcing checkbox #4 to be checked off. Turn 7: Althea draws a -1, O for a total of +2 versus the spell’s +4, so she takes another 2-point hit. She can cross off her #3 box or she can decide to take a 2-point consequence which must be Harmonics. She doesn’t like the idea of side-effects when flying—the ground is a little too far!—so she decides to take the stress. Turn 9: Althea draws +0, O, for a total of +3 and one point of stress. She decides to spend a fate point and invoke her aspect Stubborn as a Mule to turn this into a total of +5, which would beat the spell’s defense and cause its #1 box to be checked off. The Host grins and consider adding a fate point to the spell’s side, but there’s really no reason in the fiction to justify it and forcing Althea to accept harmonics is not that interesting for the story. So it comes down now to Althea with a 1-point mental stress box and the spell with one #5 thaumic cost box. Turn 10: Ow! Another -1, C for Althea, which means 2 points of stress when she only has her 1-pt box left open. She coughs up another fate point to invoke Initiate of the Order of the Temple of Jerusalem again and stacks her free invocation of Well-Researched Spell to bring her total to +6 versus the spell’s +4, finally checking off that #5 box. Turn 1: O (Material)—properly aligned. Turn 3: O (Material)—properly aligned. Turn 6: O (Material)—properly aligned, then C>O (Emotional/Mental). Turn 7: O (Material)—properly aligned. Turn 9: O (Material)—properly aligned. The most frequent unaligned type of thaumic energy is Spiritual/Dimensional, so this would dominate in the harmonics. As a result, Sister Althea’s flight could be accompanied by ghosts, or other-worldly nefarious entities; or she could move through a door to another dimension (as in CF, p. 204.) I draw from the arcana deck and I get “Sneaky.” I’m thinking—hey, a Templar, some spiritual harmonics, and the Sneaky arcana… A minor demon latches onto Sister Althea and will follow her around in her flight, spying on her. Posted on December 26, 2013 January 10, 2014 by mechanteanemonePosted in fiction, games, rpgsTagged Castle Falkenstein, Evil Hat Productions, fantasy, FATE, Fate Core, games, R. Talsorian, rpgs, steampunk, writing.